I like lots of crunch and I cannot LIE! 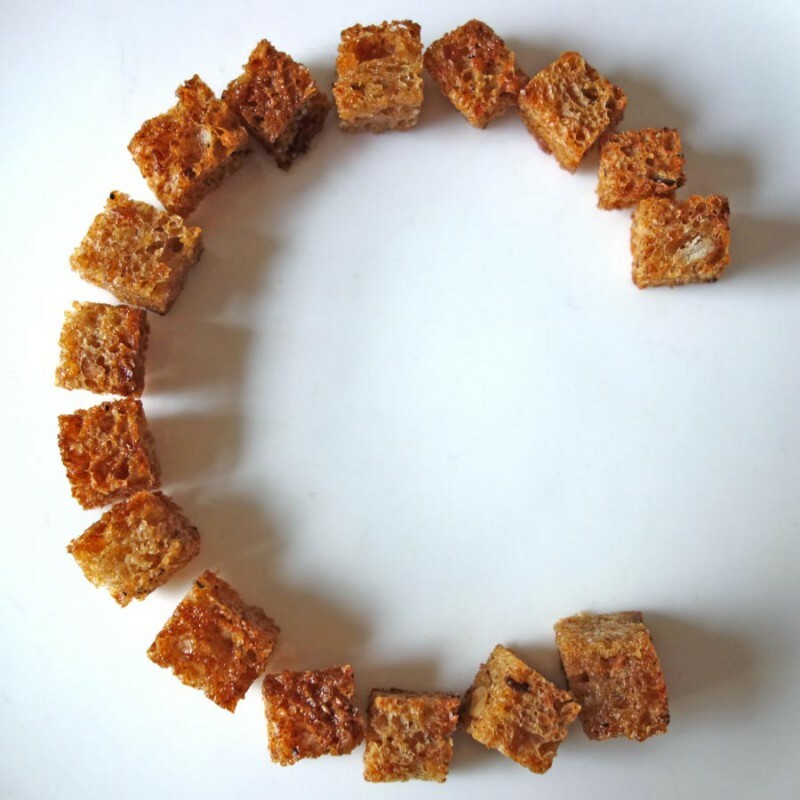 There’s something completely adorable about tiny croutons—they’re like kittens. Slice stale bread into whatever shape you like. Crust on or off is up to you. For “croutonettes” I start with stale white bread and I slice it into strips that are half the height of the bread slice, then slice the strips in half and into tiny squares. Oil a sheet pan, season it with salt and pepper, then toss the bread pieces on it with spatula so they’re mostly coated (For baguette rounds, lie them flat and brush the top side with additional oil, salt and pepper). Don’t over oil them or they will be too greasy. I find that as they cook and I stir them, the oil will cover them completely. If it doesn’t I add a little more oil. Bake for 10-20 minutes (the size of bread will dictate how long this takes), watching them carefully and stirring every few minutes, until they are golden brown. Use any type of bread you like. I find that white bread is easiest to work with for “croutonettes” because the grain is fine.